We’ve been getting lots of comments in our craft column, Once Upon a Holiday, thanking us for the craft ideas as moms are gearing up to keep their kids’ little hands busy during the impending summer vacation. 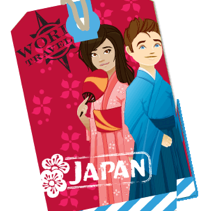 Little Passports is an awesome idea for school-aged kids (6 to 10 years old) as it combines offline and online fun while teaching kids about geography and other cultures. It takes staycation to a whole new level. This is how it works. 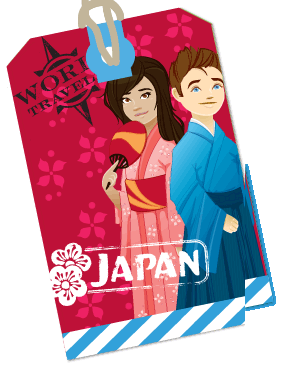 Each month their characters, Sam and Sofia, travel to a new country on their magical scooter and share their experiences with your child. 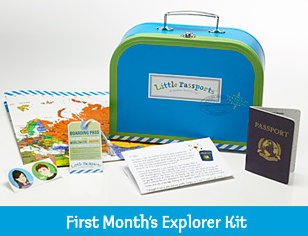 With a Little Passports subscription, your child will receive a monthly personalized package via postal mail that includes an adventure letter, fun souvenirs and access to their online Boarding Zone full of games and activities. The monthly subscription seems steep in this economy ($10.95 per month). 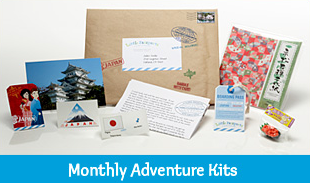 But, it includes the price of the magical adventure package (and its shipping) that subscribers receive in the mail. You can cancel your subscription at any time, so there is no need to enter into a long-term contract. Also, your purchase helps to improve the lives of children around the world. Little Passports donates a portion of every sale to SOS Children’s Villages-USA and Ubuntu Education Fund. Can’t wait to order my package today (which I did). @jules23: that sounds cool! Never heard of it before. @eCelebrating: dang it. My son is too young for Little Passports. Hope it sticks around until he’s older. Very cool. @TtownAnne: That looks like about the cutest flipping thing I’ve ever seen! Am totally doing that for my 7year old!